Gift Vouchers are perfect if you’re looking for a present for someone and you really can’t decide what to buy. They’re a great idea for birthdays, mother’s day, father’s day, anniversaries, at Christmas and are ideal as a wedding gift. 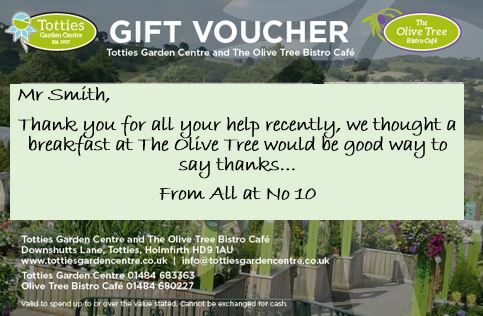 Our gift vouchers are available for the Garden Centre and The Olive Tree so the recipient can choose where to spend it. We also have an Afternoon Tea voucher and more unique a Garden Tidy Voucher which would be carried out by one of our professional garden maintenance team. Our vouchers have space on the front for you to add your personal message. If we’re sending the voucher directly to the recipient as a present please write your message in the order box during the checkout process. 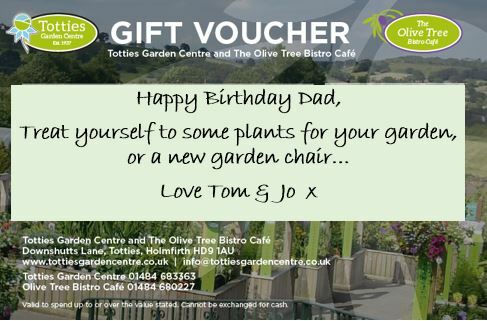 You can pick up gift vouchers at the Garden Centre and the Olive Tree Bistro, or order and pay for gift vouchers online or, if you prefer, over the telephone. Simply choose which one and the amount you want to spend, then telephone one of our friendly team who will do the rest for you. Vouchers are valid for 6 months from date of issue. Please call 01484 683363.